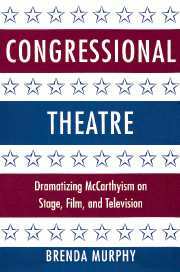 Congressional Theatre is the first book to identify and examine the significant body of plays, films, and teleplays that responded to the actions of the House Committee on Un-American Activities during the "show business hearings" it held between 1947 and 1960. Among the writers discussed are Arthur Miller, Bertolt Brecht, Lillian Hellman, Maxwell Anderson, Elia Kazan, Barrie Stavis, Herman Wouk, Eric Bentley, Saul Levitt, Budd Schulberg, Carl Foreman, Abraham Polonsky, and Walter Bernstein. Acknowledgments; Introduction; Part I. The Committee and the Culture: 1. The stage is set; 2. The social drama; 3. Dramatizing directly; Part II. Making Analogies: 4. Witch hunt; 5. Inquisition; 6. Informers; 7. Forensics; Conclusion; Notes; Screen credits; Television and radio credits; Index.